On the far north-eastern tip of Mexico, Cancun basks in gorgeous Caribbean sunshine. With average temperatures hovering at around 27 degrees centigrade and most rain falling in autumn, this could be your ideal choice for a spring or summer break. Cancun is for soaking up the sun, bathing in azure seas, eating tacos, dancing salsa, shopping in malls and maybe taking a boat trip to see the whale sharks. It’s also about flowery shirts, shrimp buckets, coconut cocktails and buzzing, tequila-powered nightlife. The Zona Hotelera (Hotel Zone), a 24 kilometre strip of sea and lagoons, is packed with purpose-built holiday resorts, varying from the conservative Ritz-Carlton with its classic interiors and traditional culinary choices, to trendy minimalist resorts where your suite could come complete with butler service and a double whirlpool bath. Drive for about 60 kilometres, just south of Cancun and the mood shifts dramatically: this is the land of the upmarket beaches of the Mayan Riviera where most discerning Europeans and Americans prefer to stay. Here your holiday options expand to include the area’s laid-back islands, exclusive, secluded eco-resorts and yoga retreats, perfect for unwinding in away from the around-the-clock partying of Cancun. Dolphin Beach is a public beach; the only one in the “Hotel Zone” that isn’t home to hotels or restaurants and it rarely gets crowded. The beach is also known as El Mirador (The Lookout) due to its fine views. You can get there easily by bus and there’s free parking available, along with sun beds and umbrellas for rent. Lifeguards survey the beach but the water can get rough here, so swim with caution. Unwind and relax at Puerto Morelos, a small fishing village with a relatively laid-back resort. The town’s very wide, white sandy beach rarely gets crowded and offers several beach clubs to hang out in, or you could hire a guide and snorkel in the spectacular Mesoamerican Barrier Reef. Take a walk to the docks and you’ll see the leaning lighthouse which was blown over and partially knocked down by Hurricane Beulah in 1967. Small, tropical Isla Mujeres is an island paradise; the stuff that beach holiday dreams are made of. The views of white sands and the aqua blue Caribbean are picture-perfect so grab your sunglasses and unwind at any of the beach clubs along Playa Norte where you can lounge for the day and savour sumptuous ceviche (a traditional seafood dish), margaritas and cervezas (beers). The sea is quite calm here as the beach faces the coast of Cancun without being exposed to the open ocean. For a lazy bohemian style beach, head for Tulum. Hollywood stars and New York fashionistas have discovered the charms of Tulum but it’s still not unusual to be one of just a few people on the beach. The “Hotel Zone” here is nothing like Cancun’s and instead of high-rise, all-inclusive resorts you’ll find thatched cabanas and relaxed, open-air eateries by the sea. Miles of wide, white sandy beach are dotted with swaying palms and the turquoise Caribbean sparkles in the sun. You can really get away from it all on a guided tour of the Sian Ka’an Biosphere Reserve with its virgin beaches, tropical forests, mangroves, marshes and large, coral reef. 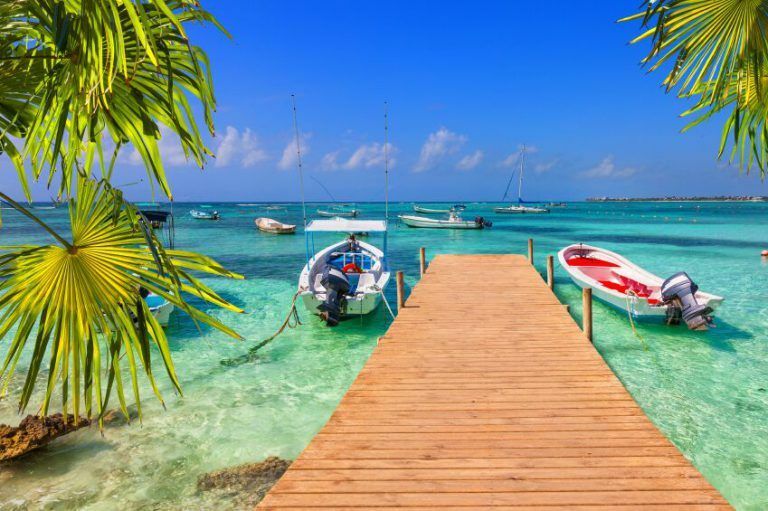 Punta Allen boasts breathtakingly beautiful ocean lagoons, beaches, dolphins, turtles and fish while Muyil brings the perfect opportunity to explore the lush jungle slightly inland, along with its Mayan ruins, wetlands, freshwater lagoon and mangrove forests. You can pick up a tour in nearby Tulum if the Reserve isn’t included in your holiday package. If you are a keen diver or snorkeler, a visit to the unique underwater contemporary art museum (MUSA) will have you marvelling at over 475 underwater sculptures on the edge of the Manchones Reef area. MUSA is a non-profit making organisation that helps conserve the natural marine life and reefs of Quintana Roo. It organises educational programmes, research and the creation of more biomass by expanding the collection, so your donations go to a very worthy cause.